The new location for the Broadway Diner is set for Ga. Highway 54 in Fayetteville just west of Grady Avenue. The restaurant had been expected to open in early 2019. Graphic/Jefferson Browne Gresham Architects. 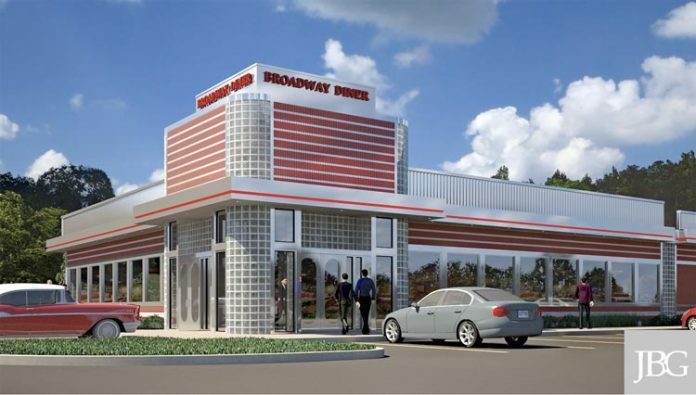 Development plans for the new location of Broadway Diner on Ga. Highway 54 near Grady Avenue in Fayetteville got a thumbs-up last month on a request for a one-year extension. The request by Broadway Diner owner Steve Theodorakis for a one-year extension was due to engineering issues associated with the project. The request was approved by unanimous vote by the Fayetteville Planning and Zoning Commission. Development plans for the Broadway Diner’s new location on Hwy. 54 West a short distance from Grady Avenue were approved on Jan. 23. Approved plans included the construction of a 7,477 sq. ft. building on 4.142 acres. 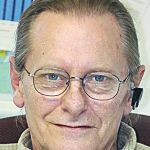 “If the city will allow me, I won’t disappoint,” Theodorakis told commissioners in January. Highlighted in red and white, the relocated Broadway Diner will provide the look of a classic American diner. Though the design departs somewhat from building styles seen in or near the downtown area, City Director of Community Development Jahnee Prince said planning staff recommended approval, noting that historic American diner architecture is a valid architectural style.